If you experienced problems booking a room at the Hilton for July 19, please see the new information here. Early conference and hotel registration ended on June 20th. ISSTA is the leading research conference in software testing and analysis, bringing together academics, industrial researchers, and practitioners to exchange new ideas, problems, and experience. Responding to the growth and impact of our thriving community, ISSTA has changed from its traditional biannual schedule to an annual one. 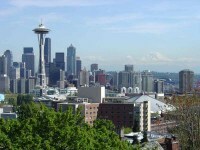 In 2008 ISSTA will be held in Seattle, Washington. Authors are invited to submit technical papers describing original research in testing or analysis of computer software. Papers describing theoretical or empirical research, new techniques, or in-depth case studies of testing and analysis methods and tools are welcome. Submissions must be original and should not have been published previously or be under consideration for publication while being evaluated for this symposium. Authors of accepted papers will be required to sign an ACM copyright release. The submission site is now open. See "Call for participation" for details. The ISSTA Doctoral Symposium is a forum for Ph.D. students working in the area of software testing and analysis to publicly discuss their research goals, methods, and preliminary results with senior researchers from the software testing and analysis community. Five associated workshops will offer the opportunity for exchanging views and advancing ideas on hot research topics. Held before and after the main conference, workshops provide a forum for the rapid dissemination of ongoing research activities. Last modified on Jan 30, 2008.